As we continue to drill ever deeper into the demographic Pet spending data from the US BLS, we have now reached the level of individual Industry segments. We will start with Pet Food, the largest and arguably most influential of all. Previously we have noted the trendy nature of Pet Food Spending – 2 years up then spending goes flat or turns downward for a year. In 2015 Pet Food Spending increased by $5.4B as a significant group of consumers upgraded to higher priced Super Premium Foods. In 2016 they value shopped and spending fell $2.99B. In 2017, spending increased by $4.61B (+17.4%). Indications from our Pet Products spending analysis are that this was driven by a deeper market penetration of premium foods along with increased pet ownership. Let’s take a closer look. First, we’ll see which groups were most responsible for the bulk of Pet Food spending and the $4.61B lift. The first chart details the biggest pet food spenders for each of 10 demographic categories. It shows their share of CU’s, share of pet Food spending and their spending performance (Share of spending/share of CU’s). Although their share of the Pet Food $ may be different from their share of the Total Pet $, all the big spending groups are the same. The categories are presented in the order that reflects their share of Total Pet Spending. This highlights the differences in importance. In Pet Food spending, higher education is far less important. Also, while Income is still the highest performing demographic characteristic, it and the other associated categories, like occupation and # of earners carry less weight in Food spending. Another big difference is that Total Pet had 6 groups performing above 120%. Pet Food had only 5. This indicates that Pet Food spending and Pet ownership is spread more evenly across demographic segments. Pet Products also had only 5 groups over 120%. This reflects the influence of the Pet Food Segment which accounts for 63% of Total Products spending and 40% of all Pet Spending. Race/Ethnic – White, not Hispanic (86.6%) – up from 85.5%. This large group accounts for the vast majority of spending in every segment. With a 126.4% performance rating, this category ranks #4 in terms of importance in Pet Food Spending demographic characteristics. While Hispanics, African Americans and Asian American account for over 31% of U.S. CU’s, they only spend 13% of Pet Food $. Pet ownership is relatively high in Hispanic households. However, it is significantly lower for African Americans and Asian Americans. This is very evident in Food Spending. Housing – Homeowners (80.9%) – up from 79.9%. Homeownership is a huge factor in pet ownership and more pet spending. At 128.6% performance, homeownership ranks 2nd in terms of importance for increased pet Food spending. Their share of market broke the 80% barrier again in 2017, up from 79.9% in 2016. This came as a result of a big spending increase by Homeowners w/o Mortgages. Income – Over $50K (70.5%) – up from 67.5%. With a performance rating of 136.9%, CU income is the single most important factor in increased Pet Food Spending. However, the over $50K income group has its smallest market share and lowest performance in the Food Segment. Since Pet Food is a “must buy” for Pet Parents, this is evidence that pet ownership is common across all income levels. Much of the lift in share is coming from middle-income segments which could indicate a probable spreading of the food upgrade and possibly increased pet ownership. Age – 35>64 (67.8%) – up from 63.1%. The biggest lift came from the 55>64-yr old Boomers. The 35>54-yr old Gen Xers also had a strong contribution. Overall, they gained 4.7% in share and their performance skyrocketed from 116.5% to 127.0%. This put them back in the top 5 at #3. This further identifies the potential owners of the Food upgrade and new Pet Parents. Occupation – All Wage & Salary Earners (67.7%) – up from 64.8% – The increase in market share was largely driven by a big spending increase by Blue-Collar workers and a drop from Self-Employed. Although performance increased to 110.8% it is still below 120%, which shows that Pet Food spending is widespread across all occupations and at the same time, reflects the substantial Pet Food spending by Retirees. This provides even more specifics regarding the Food upgrade and new Pet Parents. CU Composition – Married Couples (62.5%) – up from 61.9%. While they gained a little in share, their performance of 126.3% fell from 3rd to 5th place. This reflects the growing importance of other demographic categories. # Earners – “Everyone Works” (58.4%) – down from 63.7%. The huge drop in share by this group shows that while income remains important in relation to Pet Food spending, everyone working in a CU matters much less. Their performance fell to 101.9% from 110%. This reflects a great year by 1 Earner – 2+ CU’s and Retirees, who now account for 42% of this category’s Food spending. Area – Suburban (55.4%) down from 58.1%. Suburban households are still the biggest Food spenders, but they loss share and their performance fell to par, 99.6% due to a stellar year by Rural and an only fair year by Suburbs >2500. Education – Associates Degree or Higher (55.4%) – down from 58.6%. Pet Food Spending generally increases with education. However, things evened out in 2017. They loss share and performance fell from 113.3% to 102.4%. This provides additional candidates for the drivers behind the expanded food upgrade and new pet ownership trends. The big spenders for Pet Food are the same as those for Total Pet and Pet Products but generally have a lower market share and performance. 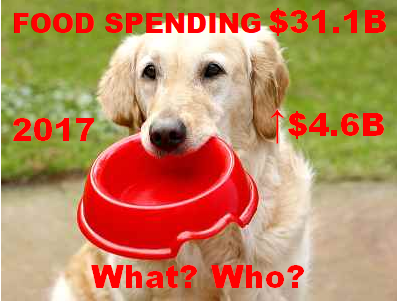 Pet Food spending was up $4.6B in 2017. We have strong initial indications that much of the lift came from a deeper penetration in terms of premium food and even increased pet ownership. Income is still important, but Occupation, # of Earners and Higher Education became markedly less so. Let’s drill deeper. Now, we’ll look at 2017’s best and worst performing Pet Food spending segments in each category. Income is important in every segment. However, the 178.7% Performance by the $200K> group is down from 188% last year and is by far this group’s lowest performance in any segment. The midrange groups are stepping up. # Earners – 2 or more earners generally means higher income. This year 1 Earner, 2+ CU’s took the top spot. This is another sign that Food spending is becoming more income balanced. Occupation – Blue-Collar workers is a big surprise. Retirees came in last but had a $1B increase. It is also extremely significant that the performance gap from 1st to last has been cut in half from 2016. Education – HS Grads w/some College is yet another indicator of more balanced spending. Age – The 55>64-yr old Boomers, along with Gen Xers are performing best. CU Composition – Married Couples won for the 3rd straight year. Single parents got off the “bottom”. Area – Rural areas had a truly great year and were the only group with 200+% performance. It’s time to “Show you the money”. Here are segments with the biggest $ changes in Pet Food Spending. Race/Ethnic – The White, Non-Hispanics share of Food spending is over 85%. A big % increase means Big $. Comment – The winner and loser flipped. African Americans spent 28.6% more on Food, but 94% of the increase came from White, non-Hispanics. Both Hispanics and Asian Americans spent less on Pet Food in 2017. However, their combined decrease only totaled -$0.07B, -3%. Occupation – A surprise winner, Blue-Collar! Only Self-Employed and the Tech, Sales & Clerical segment spent less. Comment – Here is where the Blue-Collar influence truly shows up. While a 93% increase seems spectacular, it only amounts to a $12 monthly spending increase for existing CU’s. If a number of new Pet Parents were added, the increase would fall to well below $10. The big decrease by the Self-Employed also reflects a 9% drop in CU’s. As these CU’s “went out of business” most migrated to other occupations or retired which affected other categories. Housing – In 2017, all segments spent more on Food. Comment – Homeowners w/o Mtge flipped from last to first while spending for those with mortgages was basically flat. Although the rate of increase slowed for Renters in 2017, it still continued to climb in double digits. # in CU – It’s simple. In 2017 “2” was the magic number, generating 67% of the increase. Comment: Both singles and CU’s with 5 or more people also increased Food spending. The only segments with a decrease were 3 or 4 person CU’s. However, they only fell a total of -$0.16B, -2%. Age – The 55>64-yr old group flipped from last to first. Comment: Although the 55>64-yr old were the biggest drivers, they got over $1.5B in help from the 35>54-yr olds. In fact, all age groups over 35 increased their spending on Pet Food. All groups under 35 spent less, although the only significant drop came from the under 25 segment. Education – HS Grads w/some College, a surprise and an indication of more educational equality in food spending. Comment – We can’t leave out College Grads – +$1.9B. In fact, all education levels but those with Associates Degrees spent more on Food. Their decrease comes after a 35% lift in 2016 and may just be from value shopping. # Earners – 1 Earner, 2+ CU’s are often under financial pressure. In 2017 they were the big spenders. 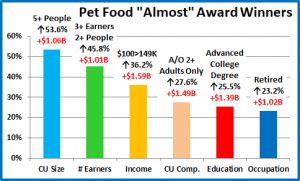 Comment – The loser is a bit of a surprise as all segments, but 2 Earner CU’s registered an increase in Pet Food spending. The drop was minor, only -2%, so it is probably part of everyone’s continuing search for a better price. Area Type – All segments had an increase but Rural was spectacular. Comment – Central Cities had an increase but flipped from 1st to last. Biggest growth – all areas under 2500 pop. CU Composition – A strong year for “2”, especially Married Couple Only, who flipped from last to first. Comment – Married Couples with the oldest child <6 was the only segment in this category to have a decrease. This group is usually younger and often under financial pressure. They dialed back their spending in 3 segments. Income – Pet Food spending moved down the income ladder as the $40>69K segment led the way. Comment – The $30>39K group also spent less on Food in 2017. The winner is a surprise, but so is the loser. The $150>199K correlates with the income of the Self-Employed who dropped out, which explains some of the loss. Region – Last year’s winner is this year’s biggest “loser”. Comment – All regions were up. The South flipped from 1st to last but are still performing at 99.6%. Some of the Honorees, like 5+ CUs, Adults only 2+ CUs and Retirees further support just how wide and deep that the increased spending penetrated the market. Others like 3+ Earners, $100>149K income and CUs with Advanced College degrees show that spending increases also occurred with many of the “usual suspects”. The Pet Food Spending increase was truly widespread. In fact, only 17 of 99 demographic segments spent less on Pet Food in 2017. That means that 83% spent more. After the big spending drop in 2016, 2017 brought a $4.6B increase in Pet Food Spending. This fit right into the pattern of two years up followed by a flat or declining year. However, the 2017 Spending lift was different from the $5.4B increase in 2015. In 2017 we didn’t see consumers trading out $ in other segments to spend on upgraded Food. Both the Supplies and Veterinary segments also had double digit growth. The increase in 2015 was driven by a movement to upgrade to super premium pet food by a substantial portion of consumers. These consumers were generally more educated, often worked as managers or were self-employed and had higher incomes. In 2016 this group began value shopping for their new food and found great deals online and in some stores, which drove spending down. That brought us to 2017. There was an extremely competitive environment with increased availability and value everywhere on these high-quality foods. This attracted the attention of a different group of consumers. The benefits of upgraded food are apparent to most Pet Parents. Now, they became a viable option for a much larger group. The upgrade “epidemic” spread to HS Grads w/some College, blue-collar workers and even to low middle income groups. It also primarily “infected” those 35 and over, especially the 55 to 65-yr olds. Although the penetration also increased in some of the traditional groups such as managers/professionals and those with advanced College degrees, it was primarily driven by more balanced spending in a number of demographic categories. Income, homeownership and marriage remain the most important factors in Pet Food Spending. However, the amount of necessary income has been dialed back and your occupation and the number of earners in the CU has become far less important. Higher Education has also become less of a factor. There was another trend of note. Pet Food Spending sought “more space” as Rural areas and Suburbs with a population of under 2500 had a banner year. Any analysis of Pet Food spending is always very important because of the unique nature of the segment. It is the only Industry Segment that is an absolute spending necessity. If you are a Pet Parent, you must buy food for your pet children and buy it regularly. In fact, every week over 21,000,000 U.S. households buy pet food and/or treats. Because it is an absolute necessity, the spending behavior on Pet Food is perhaps the most important reflection of the percentage of pet ownership across a demographic category. We have focused on the spread of the premium upgrade as the driver behind the increase. However, there may have been an additional trend at work. The APPA reported an increase in Pet H/Hs from 65% to 68%. The radical increase in Pet Food spending by the segments that we have noted can support both a food upgrade and new pet H/Hs…and help identify the likely new pet parents. Finally – This year’s “Ultimate” Pet Food Spending Consumer Unit is 2 people – a married couple, alone since their last child moved out and took “his” dog. They are in the 55 to 64 age range. They are White, but not of Hispanic origin. Neither attended College but both received special job training. Only “Dad” still works (too much) at a nearby power plant. With overtime, he will break $100K. Their house is in a rural area in the Midwest and they have a mortgage. They got back in the Pet Parenting “business” after their son left home by adopting a pair of dogs from a local shelter.